We continue our long-standing tradition of using the monthly Pick Hit section to highlight our reviewers' Top Ten lists. Some of us cheated and threw a few extra favorites on the list since it was a good year for blues recordings. 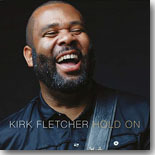 California guitarist Kirk Fletcher just keeps getting better as you will hear on his fifth album, Hold On. It's our Surprise CD this month. This month's Flashback goes back five years for the debut release, Soul Tonic, by the powerful San Diego vocalist Whitney Shay. Our What's New section features new CDs from Dave Keller, Lindsay Beaver, Mark Hummel, Seth Rosenbloom, Anthony Geraci, Gaye Adegbalola, Jonathan Long, Dean Haitani, Dennis Herrera, and more.